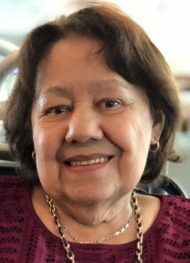 Ana Perez, 83, of Lancaster, passed away on January 25, 2019 at Lancaster General Hospital with her loving family by her side. Born in San Juan, PR to the late Jose Martinez and Cruz Galindez, Ana was a long-time resident of Lancaster and the wife to the late Felix E. Perez, who passed away in 2011. A devout Christian, Ana was dedicated to her church life and ministry at 1st Spanish Assembly of God. She loved to visit and give comfort to the sick. Family was very important to her. She spoke to her three daughters on the phone every day so she could keep up with their activities. Surviving are her daughters; Annette Esquilin, of New York, NY, Evelyn Torres and her husband Victor, of Margate, FL, and Jolie Stevens and her husband Harry, of Lancaster, grandchildren; Mark and Bethany Esquilin, Ashley Medina, Victor Jr. and Jason Carrasquillo, Brandon Cubero, and Jourdan Fernandez, and great-grandchildren; Adrianna, Marissa, Justin, Jasina, Zoey, Emi, Gianna, Victor IV, Jacob, and Noel. She is also survived by her siblings Rachel Martinez, Vickie Soto, Ester Ortiz, Jose Martinez, Samuel Martinez, and Isreal Martinez. Preceding her in death are her parents Jose and Cruz, her beloved husband Felix, and her siblings Persida Rivera and Elias Martinez. Services will be held Tuesday, January 29, 2019 at 2:00pm at 1st Spanish Assembly of God at 626 S. Duke St. Lancaster, PA 17602 with Rev. Rafael Balbuena officiating. Guests will be received prior to the service from 12:00pm to 2:00pm. Interment will follow at Mellinger Mennonite Cemetery (Route 30 Cemetery). I was so saddened on the passing of your mom. You are in my tboughts and prayers.